Fans were surprised and shocked at the news of adult Jean Grey’s return to the Marvel Universe in the upcoming and highly anticipated PHOENIX RESURRECTION (on sale in December), but the 5-issue epic is only be the beginning of exciting new adventures of one of the X-Men’s most beloved characters. Marvel is excited to announce that Jean’s story continues with X-MEN RED, a new series written by Tom Taylor (All-New Wolverine) with art by Mahmud Asrar (All-New, All-Different Avengers Generations: The Unworthy Thor & The Mighty Thor). 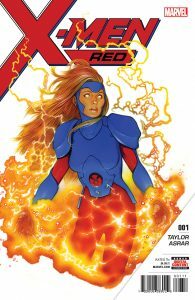 X-MEN RED lands in local comic shops everywhere this February!